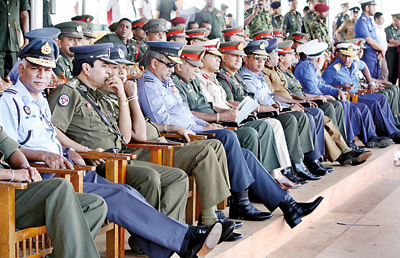 The stage is set to hold the 65th Independence Day celebrations in Trincomalee. �Thousands of civilians who were directly caught up in the conflict will be able to witness parades and pageants. Rehearsals and preparations have been underway over the past few days for the event which will be held at Black-Bay. Some 2,400 soldiers, sailors, airmen, policemen and Civil Defence Force members will take part in the parade along with 625 members of the National Cadet Corps and the Yovun Sennankaya. Eight hundred and sixty students picked from six schools in the Trincomalee district will take part in the cultural pageant.�President Mahinda Rajapaksa will hoist the National Flag at 8.50 a.m. and address the nation at 9.15 a.m. before the military march past. A number of religious events have also been organised, including one to be held at the Wilgamvehera Rajamaha Viharaya in Trincomalee at 6.30 a.m. while the Hindu ceremony will be held at the Thirukoneshwaram Temple in Trincomalee at the same time. A number of other religious ceremonies marking the event, have already been held.�Coinciding with the independence celebrations the Kantale – Trincomalee Road, Muhudu Mawatha, Pradana Veediya and Courts Road have been given a new look.